One Friday evening, Annie was craving a salad from California Pizza Kitchen for dinner. The nearest CPKs to us in San Jose are either at the Oakridge Mall or the Valley Fair Mall. Neither of which I felt like driving 20 minutes to the mall, then wasting 10 more minutes fighting for parking in the garage, and then waiting in the restaurant for another "15 to 20 minutes" (which inevitably turns into 45 minutes to an hour during primetime) with our two growling tummies plus the kidlets'. No way, Jose! Also I didn't feel like a salad. But perhaps something Italian...? I fired up the web browser and went over to Restaurant.com to see if there were any Italian places closer to us. Lo and behold, there's one right in our neighborhood: Pizzeria Andiamo's on San Felipe Rd at Yerba Buena. We had eaten there in the distant past but they had recently changed owners and I was meaning to go back. I printed out a Restaurant.com coupon, we got the kidlets into the car, and off we went. Within 10 minutes, we had found parking right in front of the restaurant, and by some great fortune were seated right away! Take THAT, CPK! We hadn't had fried calamari since our last poor experience at Gumba's in Sunnyvale (I'll post about that experience someday). 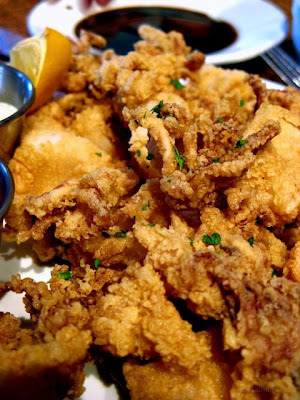 I've found that most restaurants around here don't do decent fried calamari. But we thought we'd give Andiamo's a try. You never know, right? Thankfully, these squid were perfectly fried and went well with both the marinara dipping sauce (not seen) as well as the baslamic vinegar that the waiter suggested. I was originally leaning toward getting a Pesto Castroville pizza with artichoke hearts, prosciutto and garlic on pesto sauce. But the waiter convinced me to go with his favorite, the Chicken Club. It has chicken breast, bacon, red onions, cheese and tomatoes on top of Ranch dressing sauce. Daniel wanted pineapple on his pizza so we compromized on a large pizza - half "Hawaiian" (why do they call it "Hawaiian"? 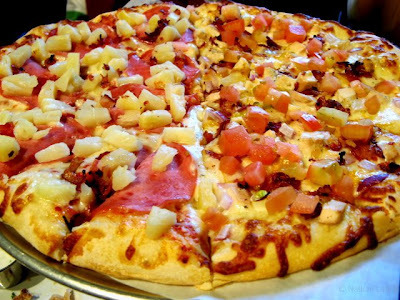 Just because it has pineapples doesn't make it Hawaiian!) and half Chicken Club. I'm sorry, but the Chicken Club just didn't do it for me. The Ranch dressing sauce didn't impress at all. Worse, the diced tomatoes were just lame. But what do you expect from fresh tomatoes when it isn't tomato harvest time? Shoulda stuck with my first instincts and gone with the Pesto Castroville. I ended up eating (and enjoying) more of Daniel's half than mine. Annie got the house salad of Spring greens, sliced apples, candied walnuts and gorgonzola cheese. She was happy. Overall, we had a good experience. The food was good, for the most part, and the staff was very helpful and accommodating. Not to mention the fact we saved 1/3 off the bill by using a Restaurant.com gift certificate. We'll be back. After all, I've gotta try that Pesto Castroville pizza.